With just two days before the launch of the Samsung Exhibit 4G and Samsung Gravity SMART launch we thought you just might be interested to know how much each of the newest Android devices on T-Mobile will cost you. The Samsung Exhibit 4G will come in at $79.99 after a $50 mail in rebate on a two year contract. The Samsung Gravity SMART will come in a little cheaper at $69.99 after a $50 mail in rebate. Both the Exhibit 4G and Gravity SMART are excellently priced as introductory Android phones especially the Exhibit 4G which offers up 21Mbps HSPA+ speeds at a low price. Any takes on these devices? Both devices will arrive on Wednesday, June 22nd. ← Is Your HTC Sensation 4G Suffering Data Connectivity Issues? The Fix Is Easy. Not bad….Not bad at all….For the price. Didn’t they tell us this in the press release last month? No, they just said under $100. Don’t know what to tell you, not sure what difference it would have made if I reposted them either. For that price, IMHO this is a pretty awesome phone, especially compared to the Smart, which ain’t too smart a buy, for reasons you point out. The slide out keyboard is probably the only reason to get that phone. Its side how the mid-range exhibit would be the high end phone a few months ago. I’m still sad that the $80 phone pretty much is the equivalent $200 G2. This time next year, the midrange phone will probably be sporting the specs of the Sensation and the new phone will probably be some 1.8 Ghz quad core beast sporting a screen with 720p resolution. Can 600mhz even handle froyo? Not a big deal but where do you see that it’s 800mhz? gsmarena says 800 but samsung.com says 600mhz. It also depends on how much the manufacturer optimizes the code for the phone. The MyTouch 3G Slide ran 2.2 with Sense(Espresso) no problem. One of the snappiest phone EVER. Only remembered it was a 600 MHz CPU when playing games. I have the Optimus T (now one of my emergency backup phones, albeit I should sell it on eBay for a quick $100 rather than it sitting in a drawer). Although the Optimus T has Android 2.2 (FroYo) its limitation is it does NOT have flash support, meaning no playing streamed video on websites. That’s a severe limitation, IMHO. Matter of fact, when I was hurriedly (and apparently carelessly) looking for a cheap Android phone to tide me over until my next superphone, had I known the Optimus T did not play Adobe Flash, I would have passed on the phone. Interesting info… why can’t the Optimus T play flash? How can you tell when buying a smartphone if it can play flash? Without flash, you might as well buy an old iCrap. Just watch your porm elsewhere when you are using the optimus T. Problem solved. 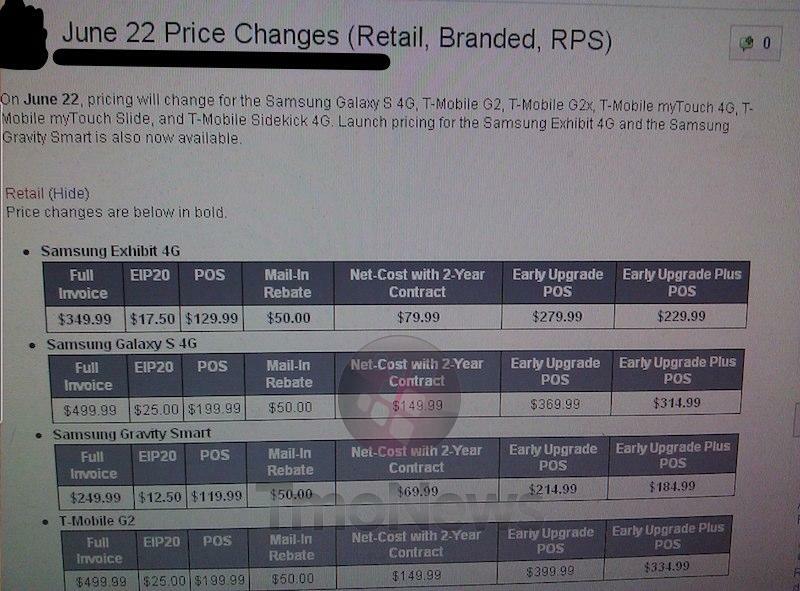 That table mentions pricing changes on quite a few phones. Anything significant? Why is the G2 up there? Because the 18-21 month price (Early Plus) dropped. The N9 is rumored to be announced officially there. Can’t WAIT!!! $10 difference between the Gravity Smart and Exhibit? Who wouldn’t pay $10 more for a bigger screen, bigger processor, a front-facing camera, and 2.3 instead of 2.2 on the Gravity Smart. Honestly, the Gravity Dumb should be free. Some people prefer the keyboard over all touchscreen. I did, until I got a Vibrant. The processor is faster, not bigger. And you’d be surprised how many people know about 2.3 to begin with. Should be more around $39.99 or so. Yes, thats a measure of speed. The higher the frequency, the faster the processor. Please know what you’re talking about before you start to. I bet 1.2Ghz Dual Core processors are HUMONGOUS compared to the one inside the Gravity!! I think the Gravity SMART is going to be a great option for many people. Not everyone needs an Android powerhouse, and I for one am glad to see a new QWERTY slider in such a small package. The price is set just right, the same price I might add that the original Gravity T launched at. As for the Exhibit 4G, I think its an awesome phone for the price. It performs on par with the Galaxy S 4G when it comes to internet speed and Quadrant scores, and even includes a camera flash. Too bad Samsung beat the poor phone with an ugly stick and decided to put it on Exhibition. Great phone under the hood. But above it? Yuck. Yeah I seen it last night and just watched the video. That phone look amazing from its build all the way to it’s specs and I couldn’t imagine you not goin for it @423ab555eb22e7187a30170dccd9811f:disqus . If I dropped Android today then that would be my only other choice. I am SOOOOO happy for you Wilma. Will you be first in line?